The history of Prague is an epic story. The city has witnessed the Austro-Hungarian Empire, independence, Nazi control, communism, then capitalism. And that is just the 20th century! Discover the significant events in the city's history dating back to the times of roaming Germanic and Celtic tribes. 5500 BC-4500 BC: First evidence of continuous occupation of the area around Prague, by various Germanic and Celtic tribes. Trade routes leading from Southern to Northern Europe pass through the area. Around 500 BC: One of the Celtic tribes, the Boii, are the first inhabitants known by name. The Boii named the region 'Bohemia' and the river 'Vltava'. 6th century: Arrival of the Slavs. Slavic settlements are established alongside the Germanic settlements around Prague. The Slavs eventually become the dominant people. 8th century: First settlement established on the site of present day Prague, in the Lesser Town (Mala Strana). 9th century: Settlement established on a hilltop site above the Lesser Town, which leads to the construction of Prague Castle. Around 870: Foundation of Prague Castle. Around 926: Construction of a Romanesque rotunda, the original church built on the site of St. Vitus Cathedral in the grounds of Prague Castle. 965: Prague first reported in the narration of Ibrahim Ibn Jakub, a merchant. 10th century: Foundation of Vysehrad on the opposite bank of the Vltava river. 1085: Prague becomes the residence of the first Bohemian king Vratislav I. 1172: Construction of Judita´s Bridge, the predecessor of Charles Bridge, and the 2nd stone bridge in Central Europe. 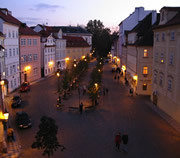 Around 1230: Foundation of the Old Town (Staré Město). 1257: Premysl Otakar II formalises the establishment of the Lesser Town, giving it town status and encouraging migrants from Northern Germany to settle here. 1310-1346: John of Luxembourg rules as the King of Bohemia. Around 1320: Hradcany, the area around Prague Castle, is established. 1338: Foundation of the Old Town Hall - the importance of the city increases. 1344: Prague bishopric upgraded to archbishopric. Construction of St. Vitus Cathedral begins (finishes in 1929). 1346-1378: Charles IV epoch - Prague becomes the capital of the Bohemian Kingdom and the Holy Roman Empire. 1348: Foundation of the New Town (Nové Město) and Charles University, the first university in Central Europe. 1419-1437: Attempts by the clergy to reform the church result in the Hussite's revolutionary movement lead by Jan Hus, the reform preacher and martyr. 1526: The Hapsburg dynasty ascends the Bohemian throne (lasts until 1918). 1583-1611: Rudolf II becomes the king of Bohemia. Prague becomes the emperor's residence and the centre of social and cultural life. 1618-1620: Defeat of the Czech nobles´ uprising; the Czech language and Czech national consciousness begin to decline. 1784: Union of the four hitherto independent Prague urban units (Hradcany, Lesser Town, Old Town and New Town). 1784-1848: Period of Czech national revival, beginning of the industrial revolution, establishment of Czech institutions. 1867: Austro-Hungarian Empire is formed as a result of the constitutional union of the Austrian Empire (which includes Prague) and the Kingdom of Hungary. 1918: Proclamation of the independence of Czechoslovakia, following the dissolution of the Austro-Hungarian Empire. Prague becomes the capital of the new state. 1939-1945: Occupation of Czechoslovakia by Nazi Germany. 1945: The Prague uprising and the "liberation" of Prague by the Soviet army. 1948: Czechoslovak coup d'état - Communist Party of Czechoslovakia, with Soviet backing, assumes control of the country, leading to four decades of communist dictatorship. 1968: The Prague Spring - a period of political liberalisation led by Alexander Dubček, who was elected the First Secretary of the Communist Party of Czechoslovakia. Efforts to reform communism were ultimately thwarted by the invasion of Czechoslovakia by the Soviet Union and other members of the Warsaw Pact. 1989: The Velvet Revolution, so named because it is non-violent, starts on the 17th November. Student and other popular demonstrations against communism result in the collapse of communist rule, and the country's conversion to a parliamentary democracy. Vaclav Havel is elected President of Czechoslovakia. 1990: First free elections after the communist era. 1993: 01 January, Czechoslovakia splits in two and the Czech Republic is founded. 1993: 26 January, Vaclav Havel elected first president of the Czech Republic. 1999: 12 March, Czech Republic becomes a member of NATO. 2004: 01 May, Czech Republic joins the European Union (E.U.). 2008: 01 January, Czech Republic accedes to the Schengen agreement and removes internal borders with Schengen area countries. This allows travel to and from these countries without checks, both at land borders and airports. 2016: The country adopts Czechia as its official short name in English. The Czech Republic remains the official full name. The change has been brought about to mirror naming conventions in other countries, for instance 'France' and the 'French Republic'. 2017: 31 May, Smoking ban in Prague and the Czech Republic comes into force. It becomes illegal to smoke in enclosed public places, including in pubs, bars, cafés, restaurants and theatres. 2018: Czech Republic and Slovakia celebrate 100 years since the proclamation of the independence of Czechoslovakia. 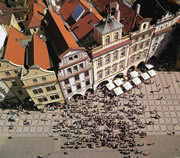 Discover more about the history of Prague on a guided sightseeing tour or walking tour. 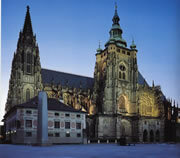 For more historical facts and a guide to the highlights of Prague, see Prague Tourism. For practical information on the Prague of today, see Prague Tourist Information.